Welsh cyclist Luke Rowe hopes to make his Olympic debut at this year's Games in Rio. 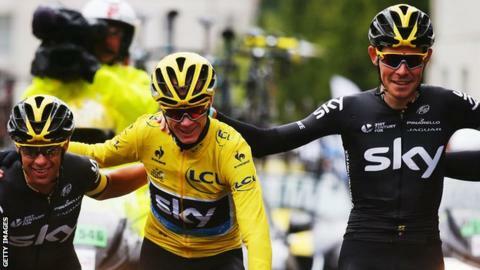 Rowe, 25, was part of the Team Sky team which helped Chris Froome win a second Tour de France title in 2015. Cardiff-born Rowe hopes to join Froome and fellow Welshman Geraint Thomas in Great Britain's five-man team for the road race in Rio - a 256.4km race which starts and ends in Rio's Flamengo Park. "I would really like to get a place in that squad," Rowe told BBC Wales Sport. "We've only got five spots but I've put my hand up nice and early. "It's still a massive thing on my radar, something I really want to do in my career." Rowe played a supporting role for Froome and Thomas during last year's Tour de France, and he would be expected to fulfil similar duties in Brazil. Although classic races on the professional circuit such as the Tour de France and Vuelta a Espana are widely regarded as the most prestigious for road cyclists, Rowe still dreams of competing at the Olympics. "The road race in the Olympics is not looked upon as big as some of the traditional cycling races on the pro-tour calendar," he added. "If you were to say to someone [road cyclist] if they wanted to win Paris-Roubaix or Flanders or the Olympics, they'd say Paris-Roubaix or Flanders. "I think it's slightly lower ranked in the cycling world but, in the UK, it's absolutely massive. "You mention the word Olympics and people get goose-pimples. It's that big, so to be part of that would be pretty special."